If you are limited on time, long weekends and holiday breaks is one of the tips I use to travel more often. If possible, you can request additional days off around work holidays to make your trip last longer. There have been many times that I’ve traveled somewhere new over a Saturday/Sunday and did not have to take any time off work. Choose from the best weekend getaways in the USA to plan your perfect weekend trip! I really enjoy weekend travel because it lets you get out of the routine and get recharged for work week even for such a short period of time. The trick is to stay close to home: there are plenty of destinations nearby within 5 hour drive or an $80 flight which you can visit during a weekend. You can leave on Friday night and be back late on Sunday! Such a quick trip gives enough time to explore a new city or have a quick nature getaway! It’s affordable and fast and you can come back again for a longer vacation if you loved the new destination! If you are planning your next weekend trip, check out how to get cheaper flights for a weekend getaway! When we went to NYC, we did just that: getaway for a weekend. The hotels are pretty expensive and we didn’t have as much time on our hands, that way we only had to pay for a couple of nights at the hotel and a flight. But once we got there, we went on a 10 mile walk from morning till night! It was my very first time in NYC and I felt like I had to see everything! And the huge skyscrapers only gave me more energy! We started by going on the ferry to see the Statue of liberty and then walked all the way up to the Times Square, stopping at all of the important landmarks on the way! With so many things to see and such little time, I would recommend breaking up the city in halves: Lower Manhattan and Upper Manhattan, and taking your time by picking just 3 or 4 locations you really want to see while in New York. Luckily, the island is not that big and you will be able to go from one location to another by foot. That way, all of the money that we did spend was only food, flights and hotels! Check out my full itinerary of the New York City trip and pick and choose some of the destinations you would like to see when you go! If you have never been to the capital of the United States, you need to see it at least for a weekend in 2019. One of the things I would really like to see when in Washington DC is DC’s annual National Cherry Blossom Festival. The two-week festival includes many cultural, sporting and culinary events and is happening in the spring. If you are not there during the festival, our nation’s capital is an exciting East Coast vacation destination. Yes, you can see the White House, the Lincoln Memorial, the Washington Monument, the Smithsonian Museums and all of it for free, but D.C. also boasts a great selection of new restaurants, cafes, boutiques and clubs. But if you’ve already seen the national landmarks, enjoy the city’s youthful atmosphere, see its urban neighborhoods, new art galleries and farmers markets. Are you planning a trip in the summer? Find the best 2019 summer vacations in the US! San Francisco is another city that absolutely stole my heart this year. We stayed in San Francisco for 6 days and took it a lot slower than we did in New York City. But it would be a great place for a weekend trip too! We also were able to snag really cheap flights with Frontier airlines to San Francisco which made it possible to stay for that long! Our hotel was right in the heart of the city and a couple of minutes from the Union Square. Luckily, it was just around $100, so we were able to enjoy the city as our summer vacation! My favorite parts are the colorful neighborhoods and beautiful views, cozy cafes and plenty of booming nightlife venues, seeing the sea lions on the bay, and strolling along the Marina. First-time Chinatown visitors are sure to come back again the next day for more ramen(we sure did)! And for the true San Franciscan experience, don’t forget to ride on a cable car. 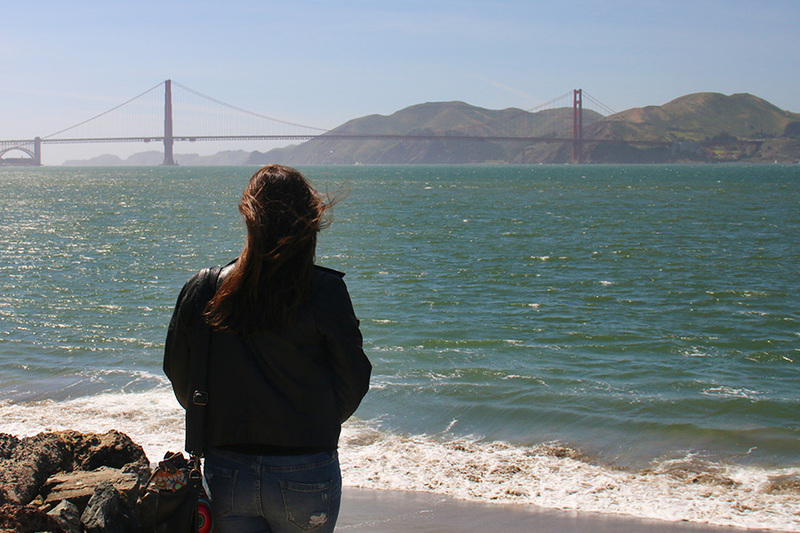 Explore the touristy Fisherman’s Wharf area, see the Presidio and the famous Golden Gate Bridge. One of the great ways to save money when you are in San Francisco is using the San Francisco CityPASS, it gives you access to many of San Francisco main attractions and a 3 day pass for the public transit. See my full review of the San Francisco CityPass here. Grand Canyon Tours from the South Rim offer the broadest range of experiences from rafting, helicopter tours, hiking and much, much more. North and South Rims are so different, that you need to see both! I would go to the North Rim in the summer since it closes in winter. The South Rim of the park is open all year round and the best time of the year to go is in the Fall or Spring. My 3rd most favorite city for a weekend getaway in 2019 is Chicago, America’s third-largest city. The city is so diverse, boasting a thriving arts scene, various shopping districts and so many new and exciting places to eat! Chicago’s skyscrapers and public art are absolutely worth admiring: spend a few hours in Millennium Park or head to Willis Tower’s Skydeck Chicago for a bird’s-eye perspective. After, visit the exceptional museums or try the deep-dish pizza at the Pier. When we visited Chicago, we really enjoyed going a deep dish pizza night. We heard so much about the pizza places in Chicago, that we absolutely had to go! There seemed to be a tie between Gusano’s and Geno’s East as the best places to get deep dish pizza in Chicago. So we went to both in ONE NIGHT! We had to see it for ourselves. Verdict: They are both amazing, but I thought Geno’s East has a fun atmosphere! Saint Louis makes the list of best weekend getaways because there are so many fun and free things to do! It’s a great city to visit in the summer and it’s not as crowded as the more popular destinations like NYC or Chicago. When you go to Saint Louis, you can’t miss the famous Gateway Arch, the St. Louis Zoo, the Science Center, and the St. Louis Art Museum. Also, be sure to visit Cathedral Basilica, a home to one of the largest collection of mosaics in the world. Take a weekend to enjoy all the live music you could ever desire. During the day, there’s plenty of restaurants, distilleries, and outdoor activities to keep you occupied. Try out one of my most favorite Nashville lunch spots – Dozen, a bakery with organic and local ingredients and homemade breads. Their lunch menu has wonderful seasonal salads, tartines and baguette sandwiches. Later in the evening, make your way to the heart of Music City and experience Broadway. Stroll the streets and go into any bar that calls your name – they are all fantastic. Robert’s Western World is famous for their cold beer, live music and fried bologna sandwiches. Paradise Park Trailer Resort is a honky tonk serving up $6 pitchers of beer, and have a cool kitschy décor. Acme Feed & Seed offers some of the best views of the river and has three stories of bars. For another fun option, head to Miss Kelli’s Karaoke Bar for Jell-O shots and singing. New Orleans is known for its European-style architecture, mouth-watering Creole cuisine and its music. A full exciting adventurous weekend is exactly what you will get when you go to new Orleans. The best weekend to visit is during the Mardi Gras festival, a Carnaval that you will never forget. We were in New Orleans on a Saturday in January and the French Quarter was booming. Carnival outfits, beads, music, and it wasn’t even Mardi Gras yet! In New Orleans, the party is year-round, just go to Bourbon Street and see for yourself! I recommend starting your trip to the Crescent City in the French Quarter. New Orleans without going to the French Quarter. The neighborhood, also known as Vieux Carré, is the heart and soul of the city. The French Quarter has held on to its French heritage, so the street names are still in French. Wander the narrow cobblestone streets to find Jackson Square and the Faulkner House. Then visit Saint Louis No. 1 Cemetery, and the Bocage Plantation to learn more about the history of this one of the oldest cities in the US. From here, explore the major architectural sites before enjoying a plate of jambalaya and a night out. United States has so many places you haven’t seen yet! You don’t need to go far to find something new! For even more ideas on unique Bucket-list worthy destinations in the United States, see my American Bucket List! What vacations are on your list of best weekend getaways? Let me know in the comments below! Great list! I appreciate the suggestions of what to do while there too! All great cities and great for a weekend getaway. Thanks for including some of your favorite spots in each! amazing places to visit and my favorite is SF. I have heard so much about Washington DC and I definitely want to go there.Great tips overall! Thanks so much for sharing these experiences with the world. One year I want to travel the entire United states within the year. I have your blog bookmarked and I will be sure to visit often for ideas. Having been to most of these locations (except St. Louis) – I completely agree! NYC is my favorite destination for a long getaway, in fact, I am considering returning for Memorials Day weekend! Cheers! Great list of places! We went on a 4 day trip to NYC and I know exactly what you mean by the 10 miles of walking! We did over 25,000 steps and even used the subway as much as possible too! Wow, that’s some whistle-stop tour there – and some great places to visit. I definitely got to get out to the States and see more if it! Thanks for the post! These are really good ideas!! I need somewhere to go in the Spring and New Orleans and California are on my list! I’ve been to every place on this list but Nashville! New Orleans is my favorite!